Discount Self Seal Bags is a free website help you find everything you need for self sealing bags that you can use again and again. Perfect for storing and organising collections of most objects, with optional write on panels to allow easy labelling and classification of contents. Find any information, compare products, prices and online-stores stocking self-seal bags, clip-close bags, MiniGrip bags (aka Grippa bags) and all other types of resealable bags. What are Self Seal bags? Self-seal Bags are closed at the top by squeezing the interlocking zipper together or has self-seal adhesive lip enabling bag to be closed and reopened many times. Ideal where you want to secure contents and avoid leakage or contamination, no need of bag-sealer, staples or tape. It is also known as Resealable bags, Gripseal bags, re-closable bags or MiniGrip bags. re-closable Self seal bags are always measured on the outside from the bottom of the zipper/lip to the bottom of the bag (L) and from side to side (W). There is about 1/2-inch of Lip above the zipper. Actual size may vary 1/4-inch larger or smaller overall. Tough bags for storing and transporting items that require ventilation. Reusable peel-and-seal adhesive strip. They are usually available in plain and printed with light and heavy duty. Ideal to store and ship bulky items. The bag has expandable side or bottom with Self-sealing adhesive strip. Write-On area makes labelling bags fast and easy. Writing area accepts pen or marker. The zipper type seal makes these bags re-closable and perfect for items that need to be kept fresh and repacked. Convenient pre-punched hole for hanging of tying. 400-Gauge Clear polyethylene re-closable bags are the perfect solution Heavy-Duty for heavier, slightly bulky items that need extra protection from sharp edges. Peel-and-seal adhesive strip forms a permanent, tamper-evident seal that must be cut or torn to open. Ensure documents or supplies are not tampered with in transit. Load items into bottom of re-closable bag. Heat seal shut. Perforated strip must be torn to open. The pink tint means you are packaging static-sensitive products in an anti-static environment. The anti-static properties will not decrease in strength no matter how many times the bags are opened, closed, or reused. Reinforced zipper side-seal gives added security to your product. Volume conductive material is made from a 400 Gauge single layer of carbon loaded polyethylene, creating a Faraday Cage effect with minimal E.M.I. and R.F.I. protection. Surface resistivity of 10 to the 3rd power to 10 to the 5th power ohms/sq cm and a volume resistivity of less than 3000 ohms/cm. If you require an self-seal bag with extra strong closure. Two tracks lock together to provide an even stronger seal than our regular seal top bags. Coloured seal top bags are excellent for storing and displaying all types of product. The zipper type seal makes these bags re-closable and perfect for items that need to be kept fresh. Bags are see-through colour. A high quality FREEZER re-closable bag at a value price: ideal for today's cost-conscious production environments. The reinforced side-welded zipper makes this polyethylene bag tough and durable: can be opened and closed again and again. Maximum protection for important documents. Reusable, semi-rigid bags constructed of thick 7 gauge crystal-clear vinyl won't crease or tear easily. Load items into bottom of re-closable bag. Strong zipper closure keeps out dirt and moisture. This Specimen bag is used in hospital and medical labs to transfer specimens and paperwork safety. Document pouch keeps paperwork and specimen together. 300 Gauge - Amber bags protect UV sensitive medications. The specimen bag is used in hospitals and medical labs to transfer specimens and paperwork safely. UV protection for light-sensitive items! Translucent polyethylene bags block ultraviolet light. Document pouch keeps paperwork and specimen together. Protect against dirt and moisture damage. Sure-tack adhesive strip won't wear out. Film meets FDA and USDA specifications for food contact. Need to know more about Self Seal bags? Mini-Grip and Slider Grip bags' essay starts with introduction and history of Mini-Grip and Slider Grip bags. It also covers variety of different names for Minigrip bags, options available in Minigrip bags, lists popular Minigrip & Slider bags and list of major UK suppliers. These not all; this essay also details product specifications, standards to consider to use Minigrip/Slidergip bags in food and medical applications. At last, explains the common uses, list of industry served and news associated with Minigrip/Slider grip bags. Looking on the internet and finding a right supplier for your self-seal bags can be daunting. What we can't help is to provide you with bags but we can list a points you should consider buying a quality self-seal bags at cheap prices. Compare prices in the industry and Save. For an example Polybags Limited, UK offers the lowest price on self seal bags. They're committed to offering you low prices, so they'd love to know if you found a better price for any bags at another retailer. Not any supplier would have any size you need in stock so choose a supplier who can make the bags as per your need. If you unsure request a Free sample of your product before you buy. Polybags Limited,UK offers this service at no obligation. Calculate total cost of plastic bags including delivery because some retailers may sell cheap bags but charge an extra on delivery. We are delighted to say that Polybags Limited is UK's top supplier of self-seal bags and polythene bags which offers most of above service. The retailer has worked with its cheese supplier First Milk to develop the packaging, which uses zip- lock technology to allow the pack to be resealed. Reclosable packaging provides consumers with both extra value and convenience at a time when they are looking for a quality product at a competitive price, said First Milk's sales and marketing director Richard Hollingdale. Zip lock means consumers do not need to re-wrap the cheese after use and it is also easier to open than standard packaging. Make storage a snap with Minigrip re-closable plastic bags. Whether you're looking to keep moisture and dust out or keep your valuable product in, our high-quality, easy-to-use poly zipper bags come in all sizes! Sturdy enough for contract packaging, manufacturing, displaying, shipping and warehousing and best of all, our premium polyethylene zipper doesn't quit when others do. Don't rely on "me too" imitations of the real thing - Follow the colour LineTM for consistent quality bag after bag. A worldwide leader in re-closable packaging technology, Minigrip has provided innovative packaging solutions since the 1950s. 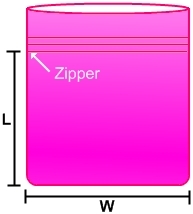 In fact, Minigrip introduced the first integral zipper in the Industrial Packaging Market in the US over 50 years ago. And when we did, we marketed our new product with a red line on the lip of each bag. Since then, our trademarked colour Line has become synonymous with the highest quality zipper bag in the world. Zip Lock Bags For more than 50 years our resealable poly bags, featuring advanced zip lock zipper technology, have displayed, stored, shipped and protected items of every imaginable sort. From collectibles, cameras and cables to tools, tackle and tape, we have just the bag you need. Anti-Tarnish Zipper Bags Keep your precious metals looking like new! Made with Silver-Guard*, an exclusive film that absorbs and neutralizes the corrosive gases that attack silver and silverplate, Minigrip's resealable Anti-Tarnish zipper storage bags ensure a tarnish-free product - even when the bag is opened multiple times. Amber UV Need to protect items from ultraviolet (UV) light? Rely on Minigrip's Amber UV Protection zipper bags for the ultimate in UV defence. Our advanced zipper technology ensures your light-sensitive items will be stored securely, with no moisture or dust. Lab Guard® Hospital and laboratory experts agree - the Lab Guard® name is synonymous for the best Specimen Handling Transport bags you can buy. Lab Guard® is invented by Minigrip® a trusted name in re-closable poly bags for over 50 years. Lab Guard® offers easy "open/close" zipper with grip ridges, meets NCCLS M29-T2 specimen handling guidelines and more. Anti-Static Many of today's sensitive electronic products need protection from harmful static electricity. Minigrip Anti-Static re-closable plastic bags not only shield their contents from static, they also provide reliable durability and protection from dust and moisture. Resealable Food Service When it comes to food storage, Minigrip offers a fresh look at quality. Our colour ZipTM resealable bags feature external grip strips for easy handling and our premium zipper operates easily with one hand! Our moisture-resistant, sturdy dispenser cartons keep these food service supplies clean and ready to use. Slider Grip Enjoy the convenience of the easy slide open/close feature that's made the Minigrip SliderGrip bag so popular. Made with durable 3-mil polyethylene, these easy-to-zip slider storage bags are suitable for a variety of uses - especially in environments where gloves are worn. Custom Products We also offer custom MiniGrip products to meet you needs. 28/07/2005 - In a bid to expand into the European market, Zip-Pak has purchased London-based Supreme Plastics' re-closables division. While consolidation of two global producers might mean less choice for food processors in the re-closable packaging market, Zip-Pak claims the purchase will mean more investment in research anddevelopment, increased technical support and better customer service. The Supreme Plastics' division produces resealable zippers and resealable bags. The acquisition includes Supreme Plastics' plant in Whitby. Zip-Pak said the division will broaden its product portfolio. A majority of Supreme's business comes from narrower zipper products. Most of Zip-Pak's business is from a market that requires wider zipper closures, said the company's president, Jim Kohl. The additional technologies expand the breadth of resealable solutions Zip-Pak provides he stated in an announcement this week. Zip-Pak has been expanding its presence in Europe. It opened a plant in the Netherlands in January 2004. Zip-Pak will also be producing zipper closures in Murcia, Spain through Plasticos Iberotec, a subsidiary of Supreme Plastics. Michael Burton, a former business unit manager of Zip-Pak's plant in Illinois, will become general manager of the company's European operations. The growth in manufacturing capacity demonstrates Zip-Pak's commitment to meeting the growing demand for resealable flexible packaging in Europe Burton said. Zip-Pak makes resealable technology through its development of the zipper feature for flexible packaging. The company is a division of Illinois Tool Works. The company has manufacturing plants throughout the US and a new plant in Europe. In April this year Zip-Pak acquired Pliant's resealable zipper division, Alliant re-closables. The purchase ended a patent dispute between the two companies, one that Zip-Pak said was causing worry among its food processing customers. Supreme Plastics also makes flexible resealable packaging and is known for its Minigrip bag. The company has manufacturing sites in the UK, US and Spain. Zipped bags are enhancing marketing appeal for many a supermarket item. They save consumers food preparation time and facilitate storage. So believes Seattle Sea Foods. Serving both real and food service markets in the Pacific Northwest, the Seattle-based processor of frozen seafood has turned to FreshZip® re-closable zippered bags in place of 4-side-sealed versions for its Sea Choice items sold in supermarkets. Minigrip/Zip-Pak provides the bag in 3 sizes for 1.5-to 2-lb quantities of Sea Choice shrimp, crab claws, cod and roughy. Equipped with an easy-open/easy-close. If baking leaves you in a floury white mess, or you don't like pouring flour from a conventional paper bag into a storage canister, Gold Medal has a tidy solution in the form of a convenient film bag that's resealable, thanks to a Zip-Pak® zipper closure from ITW Minigrip Zip-Pak. The Gold Medal brand has had a lot of flour power throughout its 120 years, most of which included the flour packed in a white standup paper bag. General Mills and Gold Medal decided it was time for something new for America's top-selling flour, says Raquel Melo, marketing manager for Gold Medal. Among FPA's winning packages sold at retail are a flat-bottom flexible bag made on first-of-its-kind vf/f/s machinery, a club-store bag incorporating a transverse zipper for reclosability, and a patented shaker bag that handily dispenses ice melt. Packaging for products sold at retail always makes a strong showing in the Flexible Packaging Assn. awards competition. This year was no exception as three of the eight winners for 1997 are marketed through retail outlets. (For a look at other FPA winners, see stories on p. 34 and 58). One is a pet food package produced on a first- of-its-kind vertical form/fill/seal system in the U.S. The pet food marketer is Hill's Pet Nutrition of Topeka, KS. Last spring Hill's introduced in Canada a flexible bag for its Hill's Science Diet® dry pet foods for cats and dogs (1). By last fall, the package was available throughout the U.S. The product is also exported from the U.S. to markets in the Pacific Rim, South America and Latin America. A European plant produces for nearby markets. Hill's and converter Printpack (Atlanta, GA) developed the structure over a 31/2-year period to replace a multiwall kraft paper bag. While the layer-by-layer composition is deemed proprietary, it's described basically as a polyethylene-based structure with a polyester exterior layer that's reverse-printed flexographically in five colours. By switching to the Printpack film, Hill's is enjoying a host of benefits. Economically, the new structure provides material savings of nearly 40% compared to the multiwall bag. Part of the savings is gained by using rollstock instead of pre-made bags. The flexible bag is formed, filled and sealed on equipment from UVA-Butler (Richmond, VA). Another key advantage provided by the new package is its ability to withstand distribution rigours. "Paper had a tendency to crease during distribution, so it didn't look as good as it could have on the shelf," says Paul Pezzoli, director of packaging technology for Hill's at the time of the change. He points out that these products sell at pet food warehouse outlets, pet stores and veterinarian's offices, but not mass-merchandise or grocery stores. Suggested retail prices range from $6 to $9 for some 15 SKUs of the products, including 4-lb quantities for cats, 5-lb sizes for dogs. While material costs savings, distribution advantages and improved shelf appeal made the new film structure terribly appealing, the company had to make sure the replacement package didn't have any serious down sides. Odor, for instance, was a primary concern. "Animals have extremely sensitive organoleptic senses," says Pezzoli, "and if they smell something they don't like, they'll turn their noses up at it." So, considerable testing was conducted to make sure the new materials wouldn't contain any such aromas that might dampen Kitty's or Fido's appetite. First-time application The new package is formed on three unusual UVA-Butler XL-460 machines. Hill's is the first U.S. plant to use the equipment. While the XL-460 performs the functions of a vertical form/fill/seal machine, it is also equipped to produce the nearly box-like appearance that makes the pack distinctive. The shape comes primarily from the flat, "block bottom", and four "pleated" side seals. Compared to the former equipment that filled the multiwall bags, "we're more efficient with this machinery," Pezzoli says. "With the old systems we had downtime, and changeovers took hours. With these, in 15 minutes or so, we can change the filling tube and we're ready to take on another product. That's important because plants often are producing to order, so sometimes changeovers have to be done quickly. When you factor in downtime for changeovers and maintenance, efficiency has increased significantly with these machines." Pezzoli wouldn't comment on machine payback, but he indicated it met the accepted guidelines of Hill's parent company, Colgate-Palmolive. Importantly, retail outlets have responded enthusiastically to the new pack, according to Colgate-Palmolive. Tyson goes re-closable route Another FPA winner uses a transverse zipper to make its bag a stand-out performer for family sised packs of frozen poultry in supermarkets and club stores. Take a gander at these outlets and it's pretty obvious that re-closable zippers are popular. Well aware of the consumer appeal of reclosability, Springdale, AR-based Tyson Foods wanted to add a zipper to the packaging of some of its cooked, frozen products. The zippered packs (2) were introduced last fall for packs destined for both club stores and supermarkets. Trouble was, the plants that produced these products didn't have the appropriate zipper application equipment, or they lacked the space to install such machinery. The solution, Inno-Lok(TM), is a zipper that is applied to the film by the converter. The technology allows the use of the same vertical form/fill/seal equipment used previously while providing the packs with the re-closable ipper. The monolayer 3-mil low-density polyethylene film is flexo printed in up to eight colours, depending on the Tyson product variety, by Pac One (Dunwoody, GA), formerly known as Polyflex Film and Converting. Pac One was the first converter to use the Inno-Lok machine from FMC (Green Bay, WI). What makes this zipper unusual is that it's applied to the inside of the front panel of the bag. The zipper is part of a 11/2" wide strip of film. In the Inno-Lok process the front panel of the bag is perforated around an "E-Z Tab." When the consumer pulls on the tab, the perforation tears and the zipper opens. Conventional zippers are applied across the top or along a side, with a male profile on one panel matching the female profile on the facing panel. Most zippers extend across the full width or length of a package, but the Inno-Lok zipper length can vary. In Tyson's case, an 8"-long zipper is centreed in a 101/2" panel. "It's definitely different, and not a traditional zipper," admits Cary Richardson, vice president of marketing for Tyson's wholesale club business. "We initially had a concern about the consumer's ability to reach into the bag, but we feel the bag represents a quantum leap for the products versus not having a zipper at all. And from a production standpoint, this zipper gave us the ability to put a zipper on a package without having to shift production from one location to another. And while there was a learning curve in using film that was thicker due to the zipper, no new filling equipment was necessary." The process of applying the zipper to the film is patented, according to Jim Yeager, president of Innoflex (Alpharetta, GA). Innoflex and FMC formed a partnership in late '96 to produce the machine for flexible packaging converters. The zipper profile is supplied by MiniGrip/Zip-Pak (Manteno, IL). For club store sales, five products, in 4-lb to 6-lb packs, sell in the new bag. Prices ary between $6.99 and $9.99. These are frozen, fully cooked offerings, primarily chicken wings. Jeff Sandore, vice president of retail marketing, says a similar Inno-Lok bag is also used for three fully cooked chicken breast products, and one beef offering, all in 18-oz portions. Suggested retail price, he says, is $7.49. Like their wholesale club counterparts, retail bags are also vertically formed, filled and sealed. Pass the salt...shaker While a zipper helps keep Tyson's packaging competitive, a different zipper serves as part of an unusually functional pack for another FPA winner. The ShakerPAK(TM) for Pursell Industries' Alaskan Ice Melt (3) is about as practical as a package can get. The "Shake & Seal" bag instructs the user to cut along a dotted line near the bottom of the bag. Doing so reveals an inner mesh-like gusset that permits the user to shake salt out the bag bottom while holding the bag by a die-cut top handle. A re-closable zipper strip allows the pack to be easily and neatly reclosed. The patented ShakerPAK is converted by Kapak (Minneapolis, MN), using films from multiple suppliers. The 7.5-mil adhesive lamination includes an inner 6-mil linear low-density polyethylene layer/1-mil of nylon/48-ga polyester. Kapak reverse-prints the polyester by gravure, in four colours. The mesh gusset material is a 4.5-mil LLDPE film that's heat-sealed to the printed film by Kapak during the bagmaking process, at which time the zipper is also applied. Kapak then ships bags to Sylacauga, AL-based Pursell Industries. According to Judy Johnson, Pursell's purchasing agent for packaging, the 8-lb pack, available since last fall, replaces the previous 10-lb plastic bag. "We were looking for something that would be unique and user-friendly, a bag that could be used easily," she says. "And we're thrilled with the differentiation the pack gives our product." Unfortunately, most retailers were already stockpiled with all the ice melt compound they could handle this year, so sales have been limited. Johnson also tells Packaging World that the new bag costs 50c more than its predecessor. Its convenient shake and reseal features, she says, "have us excited about future sales." If you looking for a quality mailing bags at cheap prices then please visit www.mailingbags.co.uk for all your plastic mailing bags needs.